james stephoto, originally uploaded by coco+kelley. Did you all have a great start to the week? There are so many exciting things I'm up to this week that I'm really excited. Especially because one of my favourite bloggers will be guest posting this Thursday. 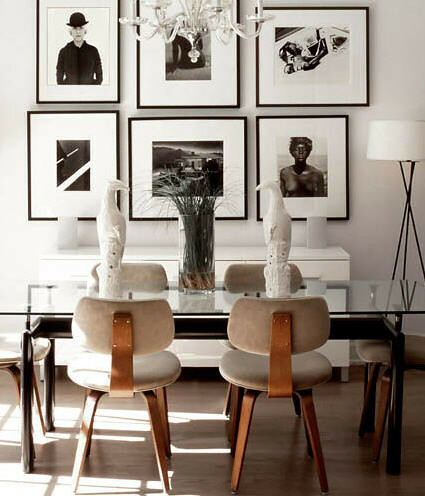 Isn't this the most perfect dining room? I love the monochrome images on the wall. I remember once saying to my Daddy P "What Monochrome is to Chanel is what Hydrology is to me" I guess it's a good thing that he didn't have a clue what I was talking about. I love how you guys are into kiting too! I thought it was some weird niche thing that no one understood. Click on the image for its source, for those who've never visited, you have to check out www.cocokelley.com she's an utter inspiration! Have a wonderful eve, I'm catching up on all your posts and I'm feeling incredibly inspired!